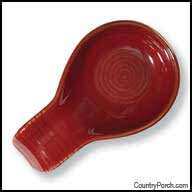 The Country Porch features the Aspen ceramic pottery dinnerware collection from Park Designs. Aspen ceramics were designed to celebrate potters' craftsmanship in form and design by integrating rib details often created from the potter's wheel with an innovative reactive glaze that creates unique characteristics in each piece. Made of durable stoneware, this collection is microwave, dishwasher and oven safe. View the entire Aspen Kitchen Decorating Theme. Return to our entire Ceramic Pottery collection.